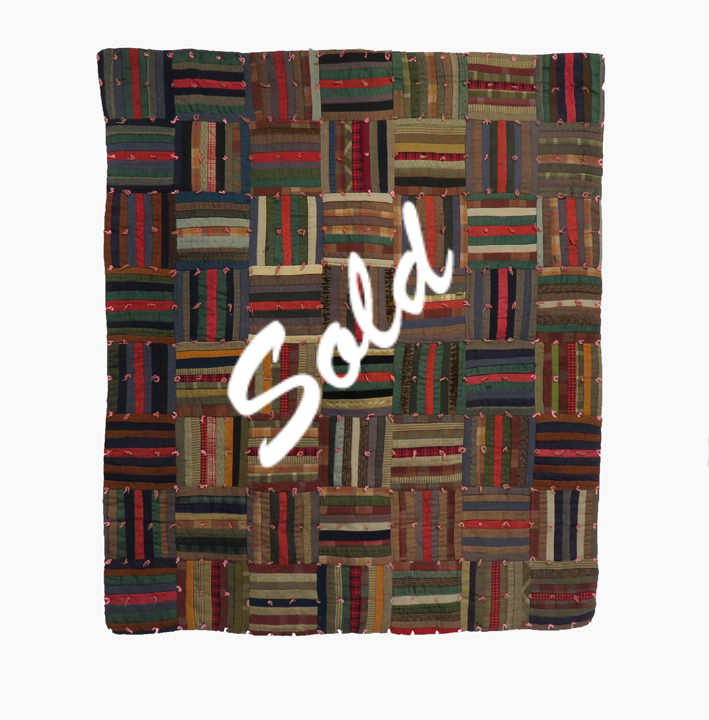 The antique and vintage quilts in this category have one major thing in common - they are all priced under $1,000 and are wonderful finds for new and experienced collectors alike. 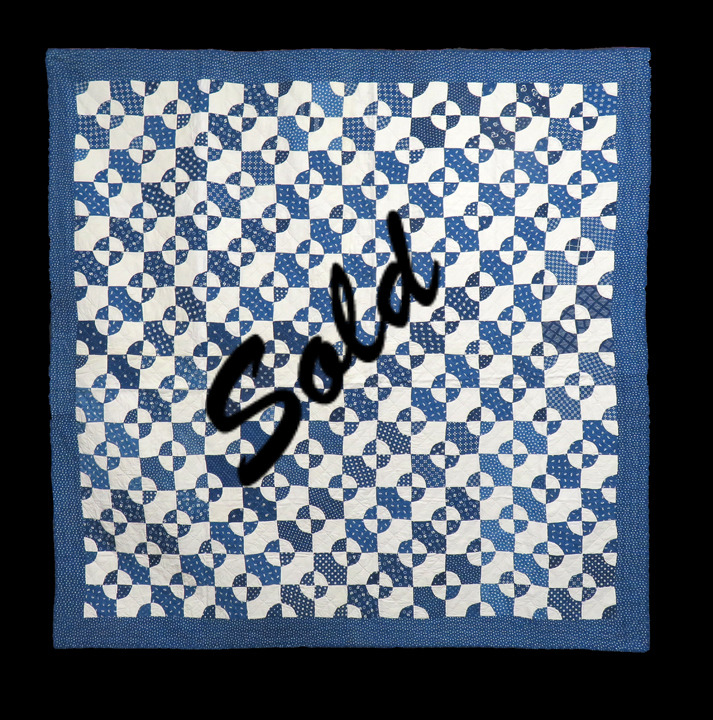 Quilts in a wide range of designs from traditional to folk art, and sizes from extra large to sweetly diminutive, can be found here. 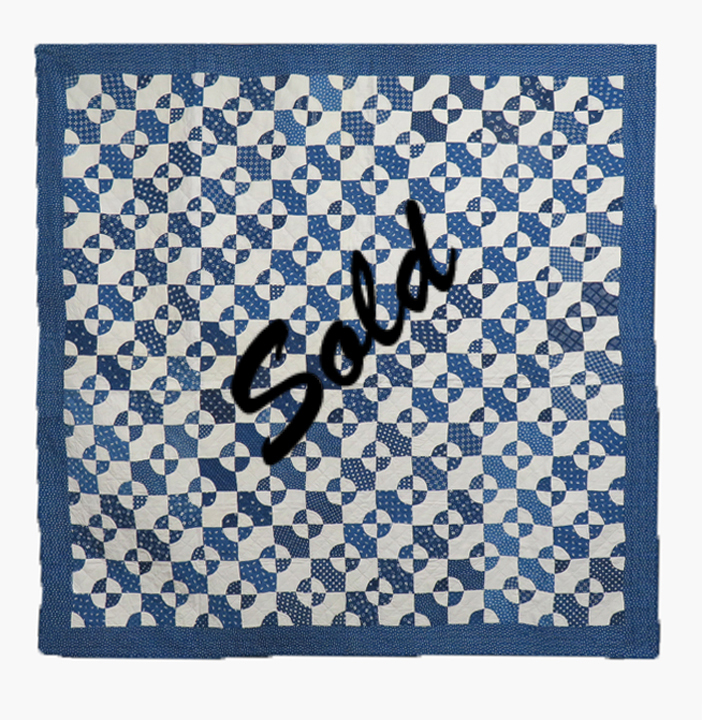 As with all of our antique and vintage quilts, every quilt on this page is guaranteed for value, dating and condition. Click on the pictures below to see more views of my Antique Quilts. Shading is due to lighting, not representative of the quilt. Please call for the availability or any questions. This classic quilt in the Grandmother’s Flower Garden pattern contains a fun assortment of florals, plaids and calico fabrics from the 1920’s. Each hexagon measures 3/4 inch per side, or 1 5/8 inches across. 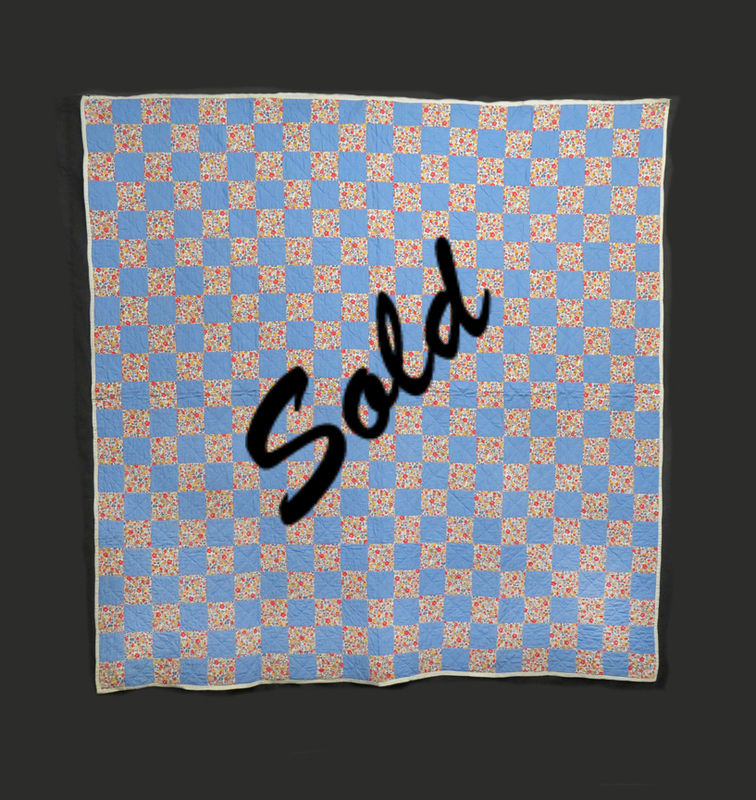 Created from vibrant and happy prints this beautiful textile is in excellent condition. It has been lovingly hand pieced and hand quilted in outline stitching. The artistic use of color and variety of patterns only add to the visual impact and are a testament to the care taken while creating this piece. A lovely soft green, the same color used for all flower centers, frames this piece as an applied 1/2 inch scalloped binding. The backing is the same white cotton used for the front of the quilt. This is a lovely example of the Grandmother’s Flower Garden pattern and would be a wonderful addition to any collection. For use on your bed or as art for your wall. This quilt has been professionally hand washed by Betsey and appears unused. Remember, all our quilts are sent on approval to review in your home prior to a purchase decision. 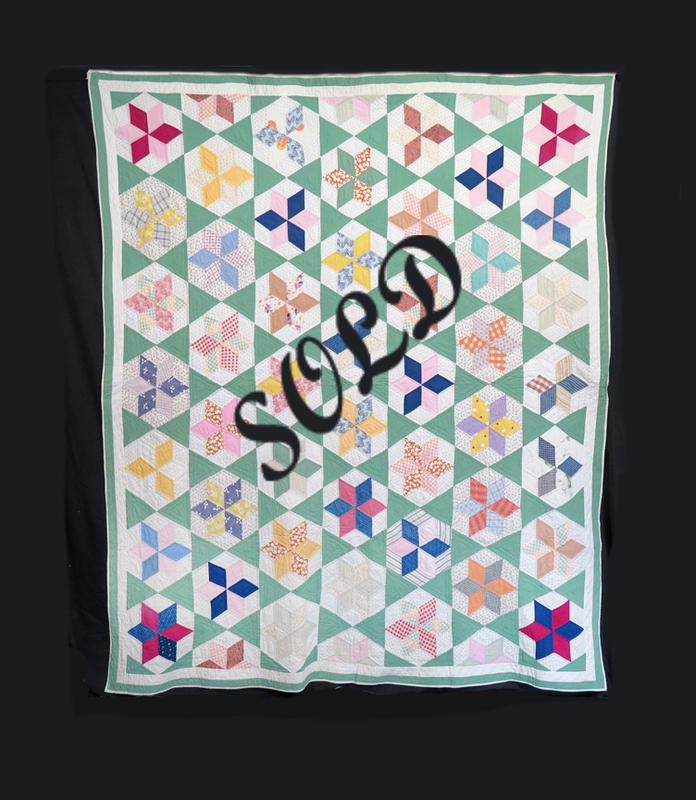 This happy schoolhouse quilt was created during the early part of the last century and is comprised of 30 blocks each measuring approximately 10” square. Each schoolhouse block is joined with a 3” white sashing. Some of the fabrics used for the schoolhouse are from the 19th century. 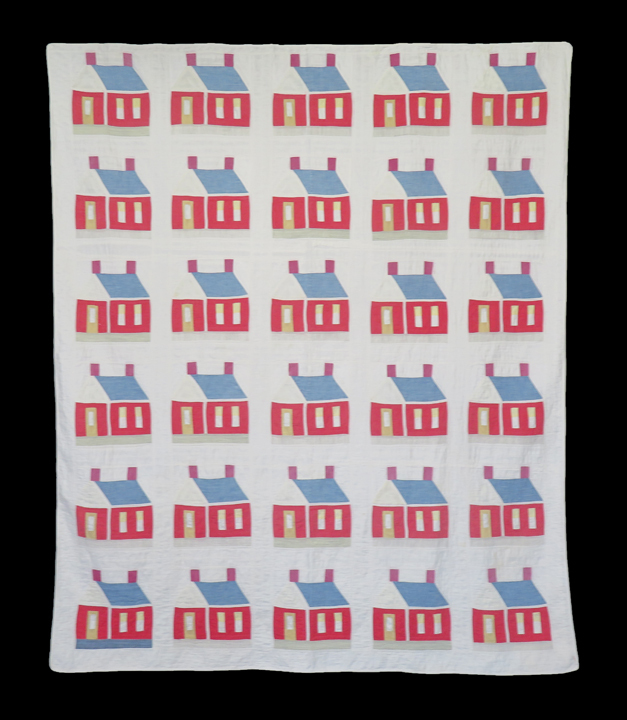 This quilt is a fun red, white and blue schoolhouse with unusual purple chimneys and a reverse appliqued window in the front door. A 1/4” applied binding edges the quilt. All of the quilt pieces are joined by machine. All of the quilting is executed by hand in an outline and diagonal design. Organically hand washed and ready to be sent for your approval. Please ask for more details. This quilt came with a note from the maker dated 1905. It’s hand pieced and hand quilted and made from fabric dated from the 1880s. The squares are 3-1/2” and the circles measure 3” around. The border is 3” wide and the binding is 1/4”. It is medium blue and white. All work is done by hand. Feel free to ask for more information. 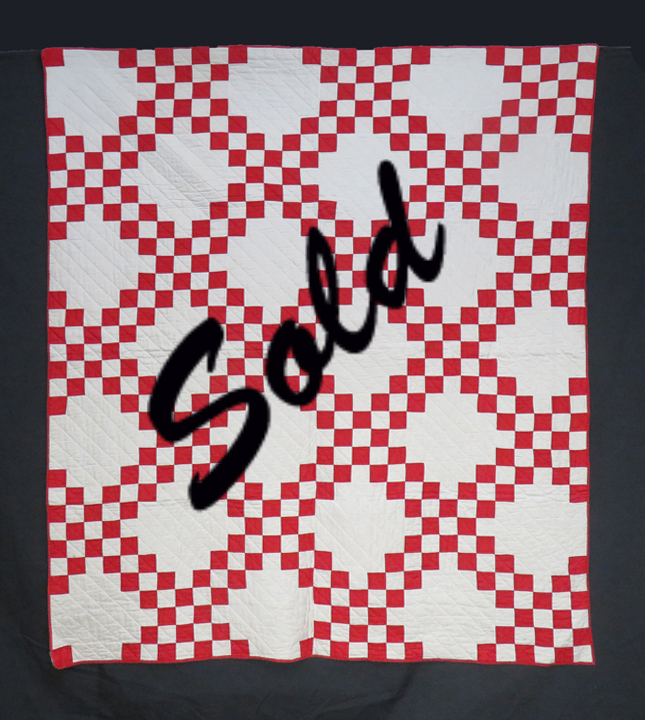 This very graphic red and white quilt has wonderful piecing and unsophisticated quilting. 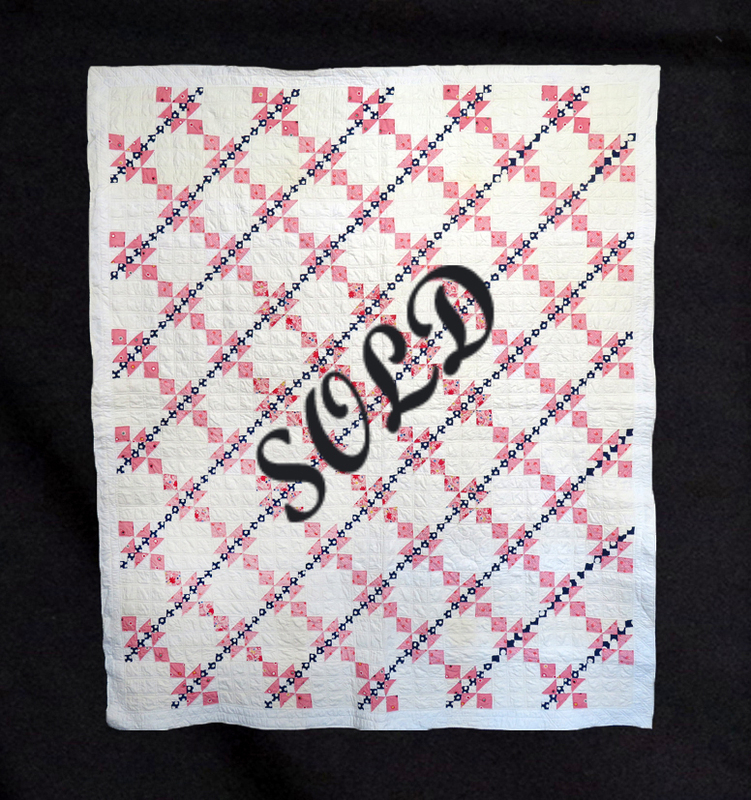 This quilt was finished with a turned over binding found frequently in Pennsylvania. Meticulously machine pieced creating fantastic graphics. Quilting stitches uneven. It was not unusual to find women who enjoyed piecing and not quilting, and visa versa. I think this quilt may have been made by two people or one person with special talents.... Organically hand washed and ready for your approval at home. Because of the large dimensions and the fact that this quilt can be used in either direction, it will fit a single, double or queen size bed. Completely appliquéd and quilted by hand with a pillowcase, slightly scalloped edging, also finished by hand. An exquisite center medallion has been executed on this quilt. 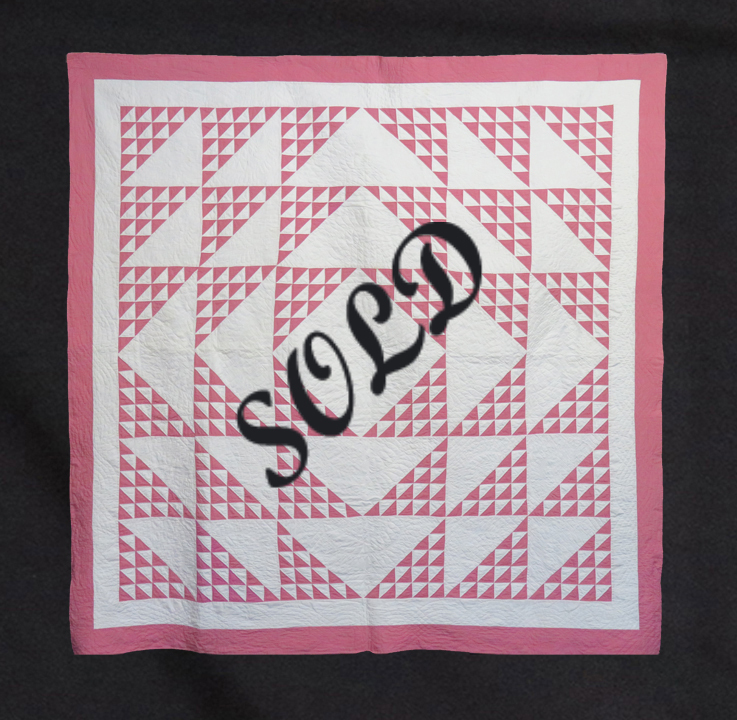 To obtain a kit quilt, someone would send away to one of the cotton batting manufacturers and purchase a pre-stamped top, a backing and all the pieces to execute a beautiful quilt. Usually but not always, these kits were appliqué kit quilts. I’m not sure if this quilt was never used, but it was certainly hardly used. When one looks closely, one can still see the blue dots to follow for quilting. There is an alluring array of quilting patterns seen on this piece. Some include wreaths, other wreaths circling the quilt and quilting that mirrors the bows. Nicely executed, and as a crowning touch, todays colors are seen here. Coming from New England, professionally hand washed by Betsey and ready for a new home. 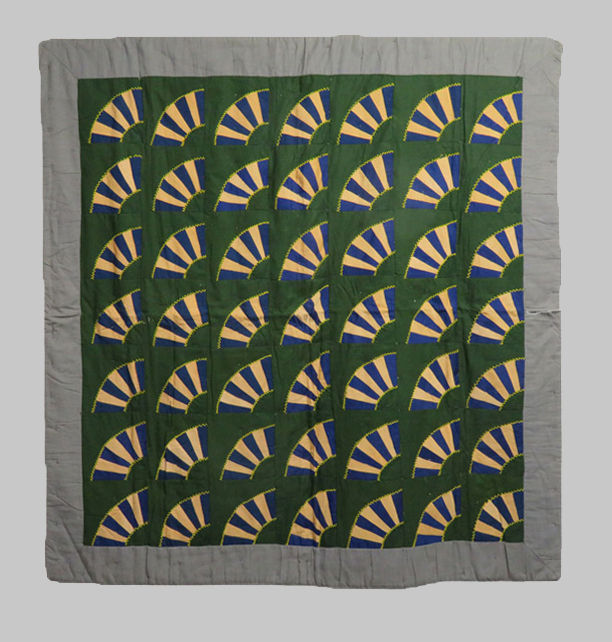 I found a very creative and well executed 20th century rendition of a 19th century tulip appliqué quilt. This coverlet had been painstakingly created with cut cotton chenille stitching being completely hand done. Original, unusual and beautifully executed. This piece of art is a happy light weight cotton bed cover. Measuring 75 x 92”, this piece will nicely cover any size bed from a twin to a king as it can be placed in either direction. 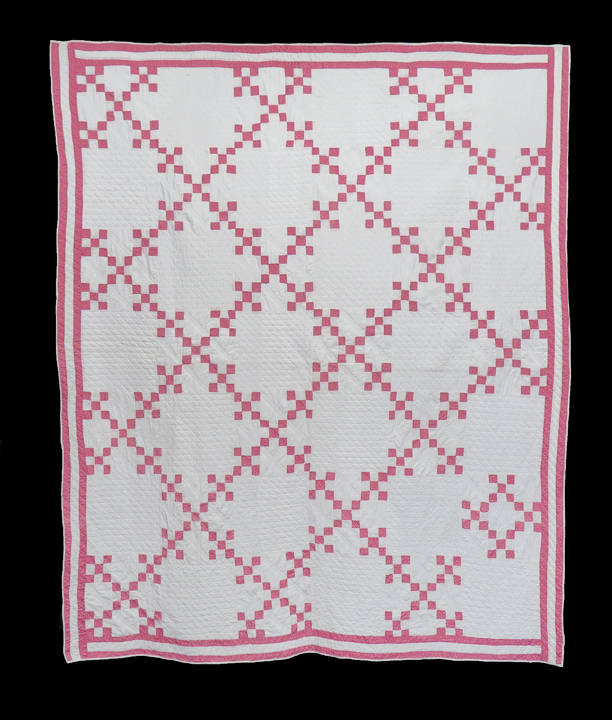 The creator had edged this coverlet with a 3” pink border surrounding the off white main fabric. The colors used in this folk art piece are typical for the 1920s and 1930s. Organically hand washed and ready for your home. Wool crazy quilts were made to be used, unlike silk crazy quilts that were made a for artistic embellishment. Here we have a woolen Crazy quilt that was made as a lap quilt. 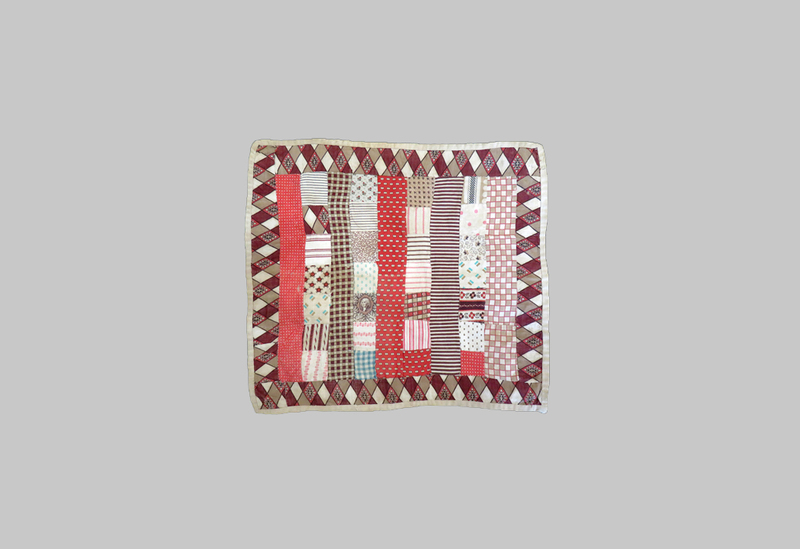 This diminutive quilt is comprised of 12 10-1/2" blocks that are wool, wool challis and some cotton flannel. The backing is a cotton flannel making this a very cozy lap quilt. It had previously been hung on a wall so pockets are sewn on and it’s ready to hang. Most of the fabrics are from the 1880s, but since there are also fabrics dating 1890, we need to date it c.1890. Ready to be sent for your viewing and approval. The size of this New England Roman Bars Quilt is perfect for a wall hanging in any variety of places or as a cozy and warm lap quilt. Made of wool and silk velvet with a paisley backing. Comprised of a large array of fabrics and colors that are warm and soothing. Overall, the colors are muted yet graphic. A stunning and sophiticated small quilt ..
A c.1895 very rare and unusual rendition of the Drunkard’s Path pattern. 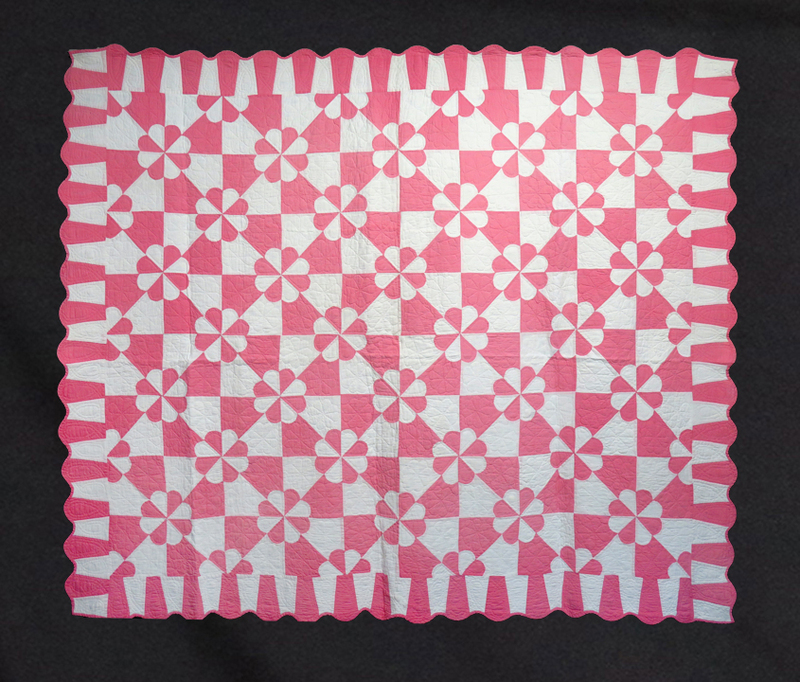 A very popular pattern with quilters who were against consuming liquor. 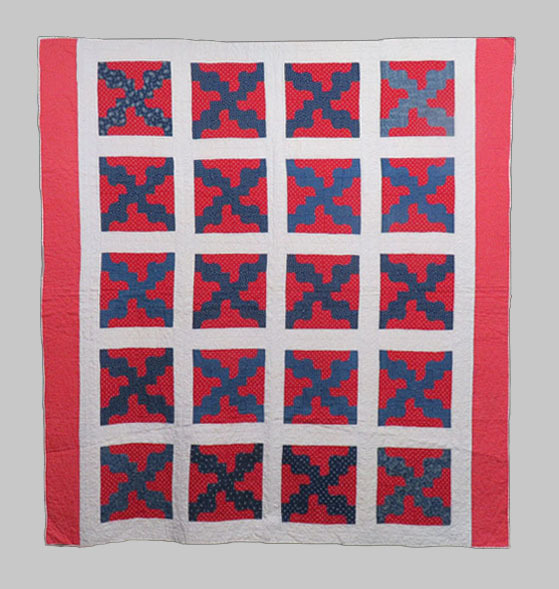 This pristine quilt is comprised of 20 blocks, each measuring 12” square and all joined by strips of white with red dot 3-1/2” sashing. The backing is a very similar whole cloth fabric creating a reversible quilt. Another fabric used in the construction of the block is an indigo calico. The 1/4” binding is turned over from the back and finished by hand. All blocks are pieced by hand then joined to the sashing by machine and finished with hand quilting. This mint condition quilt certainly fits a description of patriotic. Around two sides of the outer edge of there is a 6-1/2” border. The fabric on the other two sides is a red with white polka dots. 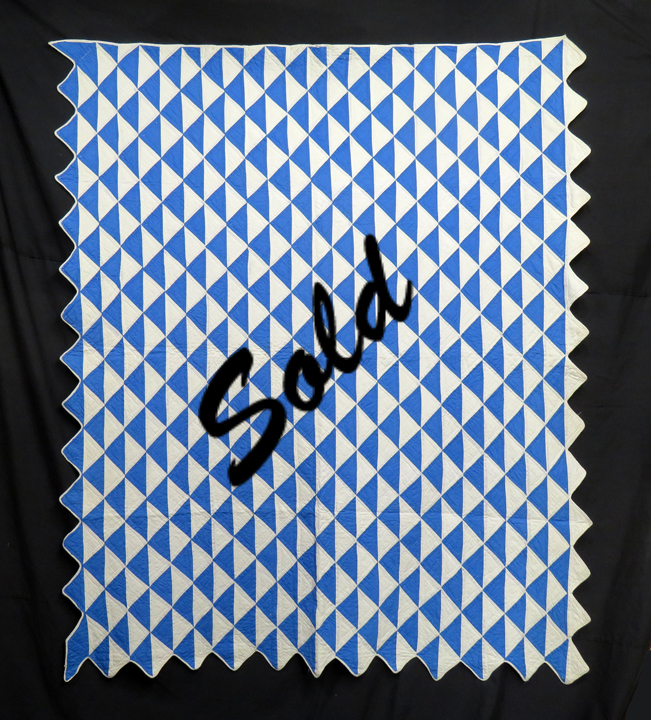 I am happy to send this mint condition quilt for your viewing and approval. An unusual rendition of Sunbonnet Sue parading on a rainy day wearing her rain gear and galoshes. What a happy quilt! It just makes me smile. Created from 25 10-1/2 inch square blocks, joined with apx 3-1/2 inch Provence blue sashing. A beautiful shade of blue. All embroidery and appliqué are executed by hand while all blocks are joined by machine. The 3/8 inch binding is applied by machine and finished by hand. The quilting stitches on this quilt are tiny and perfect. All work was executed by an expert quilter/sewer. Organically hand washed by us and ready for your your approval in your home. A soft and cozy lap robe comprised of wonderful velvet mohair blocks of different sizes. Twenty five richly toned, saturated color blocks of olive, wine, russet, and deep blue mohair measure approximately 9-1/2” square in the center arrangement. An inner border 4-1/4” wide surrounds the center in alternating blocks of color. The outer border consists of 3-1/2” wide solid strips of mohair in deepest russet. There is some moth damage on one of the blocks. Please see the photo. We have discounted the price substantially. The backing is solid peach cotton which is attached to the front with a pillowcase edge and no quilting or tying. Treadle machine top stitching one inch in from the edge gives a nice finish. Rich toned mohair that is soft and cuddly makes for a wonderful lap robe and would be perfect as a throw on a sofa or bed to bring a spot of warmth and cheer to a room. A terrific and unusual piece for us, it is quite luxurious, a great size, and even lovelier in person. It can be sent to you for private viewing in your home before deciding to purchase. This quilt already has sleeves sewn on the back in case you would like to hang it as art on a wall. How unusual to find a double sided quilt of any size. Usually when a quilt top was pieced it would then be stuffed and backed and be ready to use. In this case, both sides are complete pieced quilt tops. Both sides are pieced by hand and the tops are layered with cotton and reverse tied apx every 4”. The 1/2” binding is also hand applied. This quilt measures 48 x 48” which is very unusual for crib quilt. 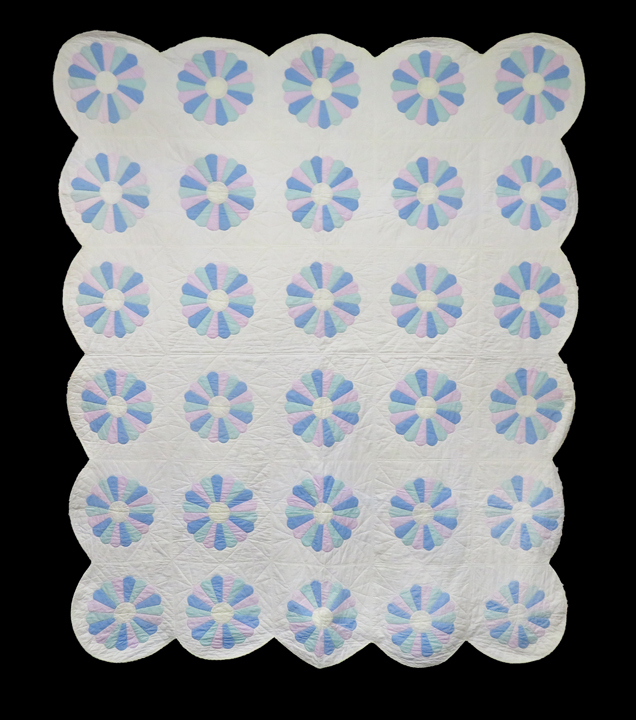 Crib quilts are generally rectangle shapes measuring apx 36 x 48. It’s possible that the original purpose of this quilt was to be used as a lap quilt. You have the optical illusion tumbling blocks on one side and the nine patch block formation on the other. Hand washed by Betsey and ready for snuggling. I have had this wonderful quilt in my living room for years. Now it’s time for it to go on to someone else. 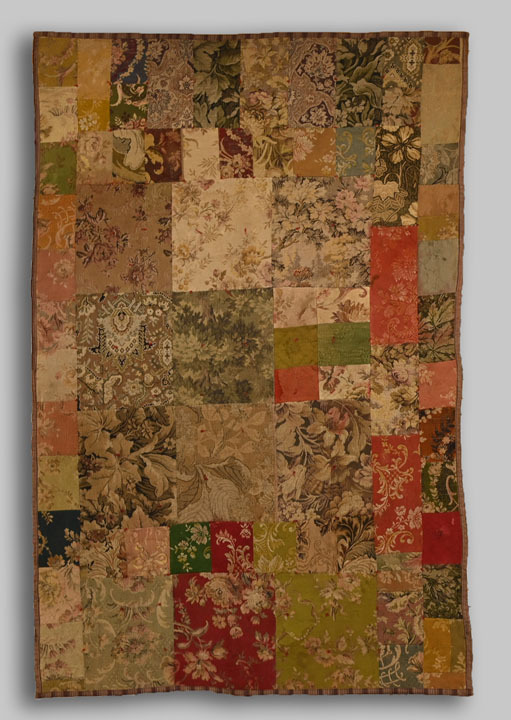 This quilt is comprised of various sizes and shapes of upholstery fabrics from the late 19th century. The dimensions of this tied quilt make it appear to me that it was made for a Victorian chaise lounge. I can picture a Victorian woman, dressed in her lounging robe, lying on a chaise covered with this quilt. :-) The large array of muted earth tones would fit into about 8 or 10 different color schemes. Yes, these are the colors of my living room! Piecing on this quilt is all done by machine with the binding turned over from the back and then hand stitched down. The backing fabric is an earlier muted burgundy, beige and brown stripe. This piece is hand tied and has been professionally hand washed by Betsey and is in wonderful condition. If you choose to hang it on your wall, it can be hung in either direction. I had it positioned over the back of my sofa in an easy to grab place for a covering. 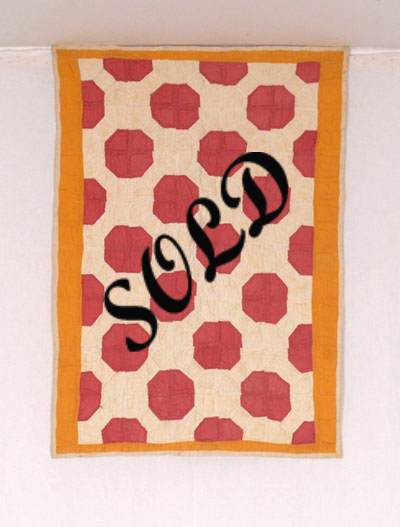 This very sophisticated 19th century quilt is all set to be seen on approval. This Double Irish Chain in red and white was created around c.1885. Heavier in weight, this quilt was made to keep one warm. For some unknown reason it was never used. It is comprised of 2-1/4” squares making up the Irish chain. These squares have been pieced by both hand and machine, sending us a clue that possibly more than one person helped in making this quilt. The Turkey red 1/4” binding is hand applied. The squares are red, not Turkey red as the binding is earlier turkey red that dates from before the Civil War. The entire quilt has been quilted in a diagonal grid apx 1-3/4” apart with what I would call sort of beginner's quilting. :-) This happy quilt has been professionally hand washed by Betsey and is ready to be seen on approval. 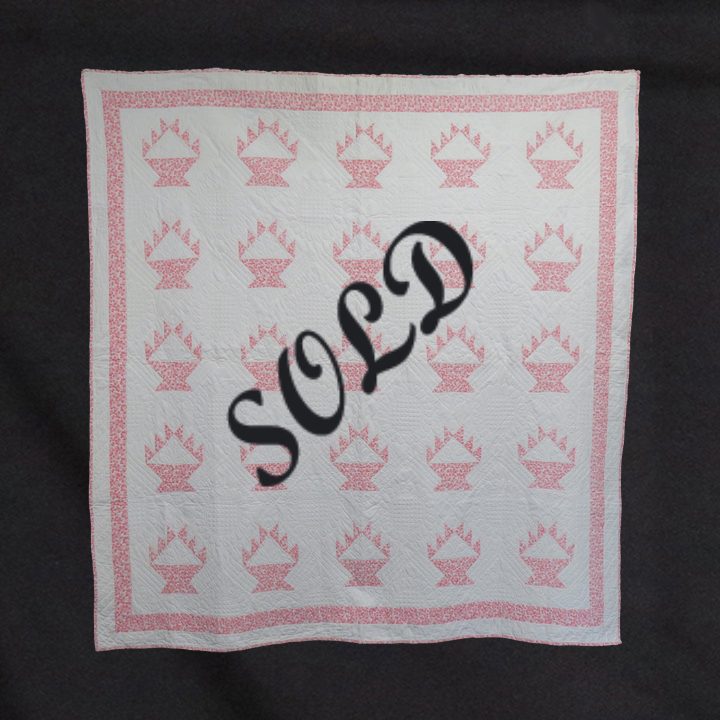 This quilt already has sleeves sewn on the back in case you would like to hang it as art on a wall. 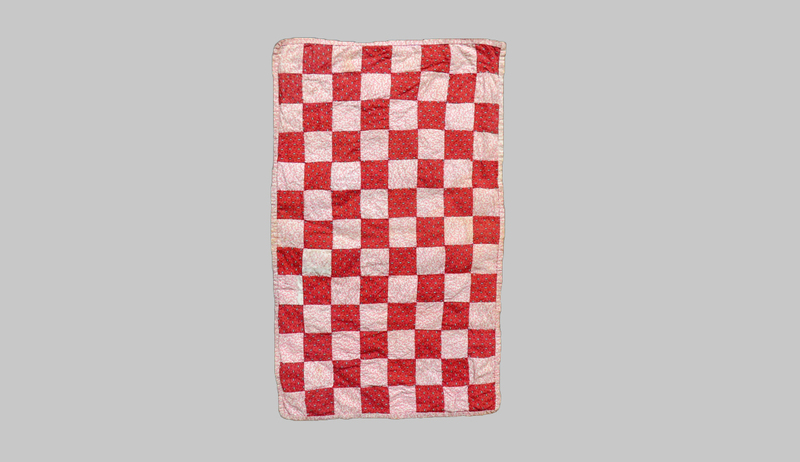 This one of a kind Red Work Child’s Quilt appears to have taken 6 years to complete as it is dated 1904-1910. This special political, folksy Red Work quilt top has been created from 30 6-1/2” blocks joined together with a 3-1/2” red sashing. There’s an American flag flying over embroidered and dated initials, embroidery representing fireworks, probably representing the 4th of July celebration. This piece is filled with Victorian symbolism and items important to a little girl's life. Antique quilt tops are never washed until they are quilted, so this is in original, as found condition. Discovered in Maine. All ready for you to quilt or collect as is. This very sweet quilt has been lovingly used over the past 90 years and is now now soft and cuddly. There are dozens of different fabrics pieced here, creating a quilt perfect for a fabric "junkie". The hexagons are all outline quilted and the center of each hexagon has a quilted circle. The hexagons are 2” side to side, all hand quilted and hand pieced. Two sides have apx 3” lavender calico borders while the other two sides have apx 4” calico borders. The binding measures 3/8”. Organically hand washed by Betsey and ready for your home. The Dresden Plate pattern was one of the three most popular patterns during the depression era. It is a pattern loved by many and treasured to the extent that many were not used and have survived in perfect condition. This is one such quilt. 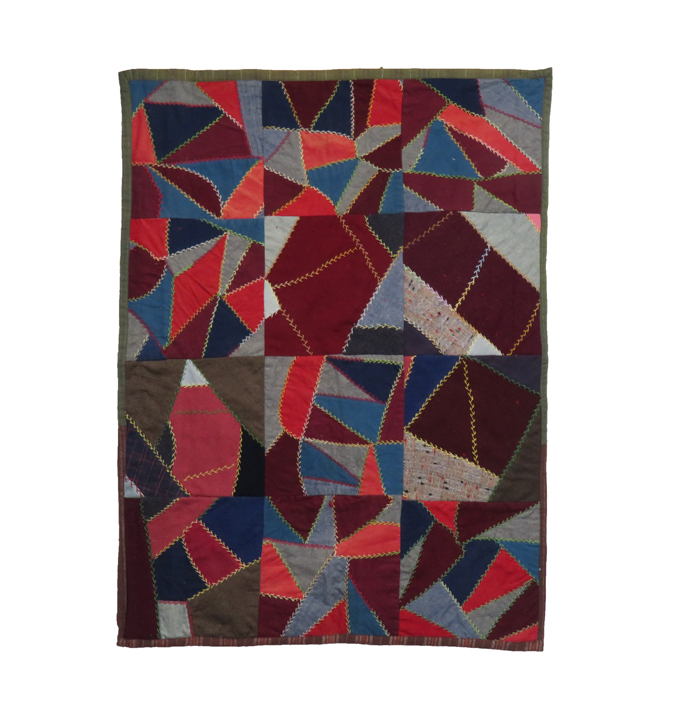 It’s rare to find a Depression era quilt created from solid color fabrics. Most of the quilts from this era were scrap bag quilts. 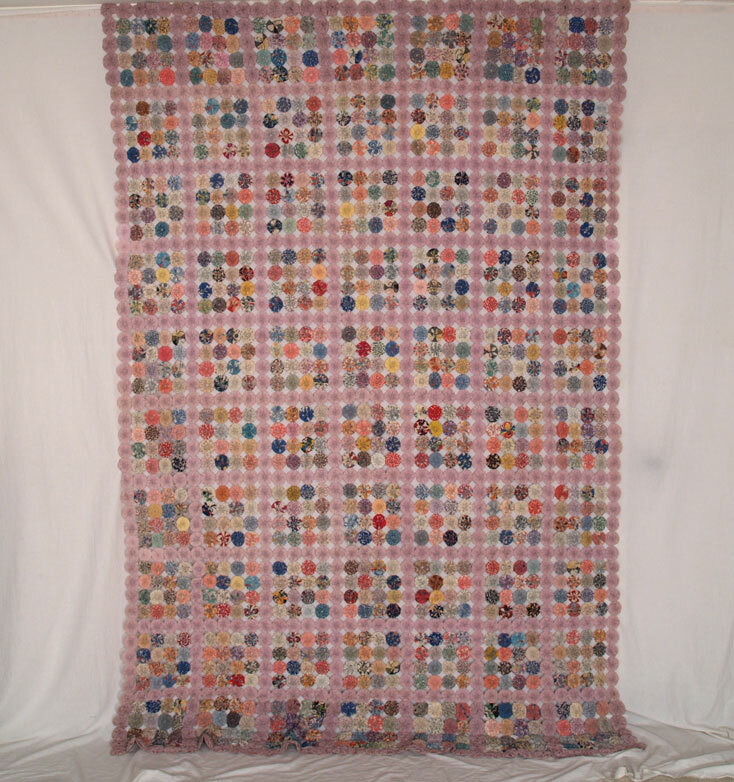 This quilt is one created from purchased fabrics. It has never been used. It could have been made for a cherished family member, a wedding present or friend who may have moved away. The blocks measure 16-3/4” square, the binding is 1/4” and the long spokes measure 4-1/2” in length. The center circle of the plate has a 3-1/2” diameter. It’s unusual that this quilt pattern is finished with scalloped edges. Such edges are seen on the Double Wedding Ring pattern. Because of the size, this quilt can easily fit a queen size bed. The background fabric is slightly off-white. It is in perfect, unused condition. The solid fabrics go well with most decors. This sweet and unusual Bars Quilt is comprised of alternating 1” strips . Postage stamp squares in a 4 patch configuration comprise every other row alternating with a c. 1890's pink fabric with white polka dots...comprise the alternating bars strip. The 1880’s and 1890’s fabrics have created an interesting combination of pink, black, white, polka dots and calicos. 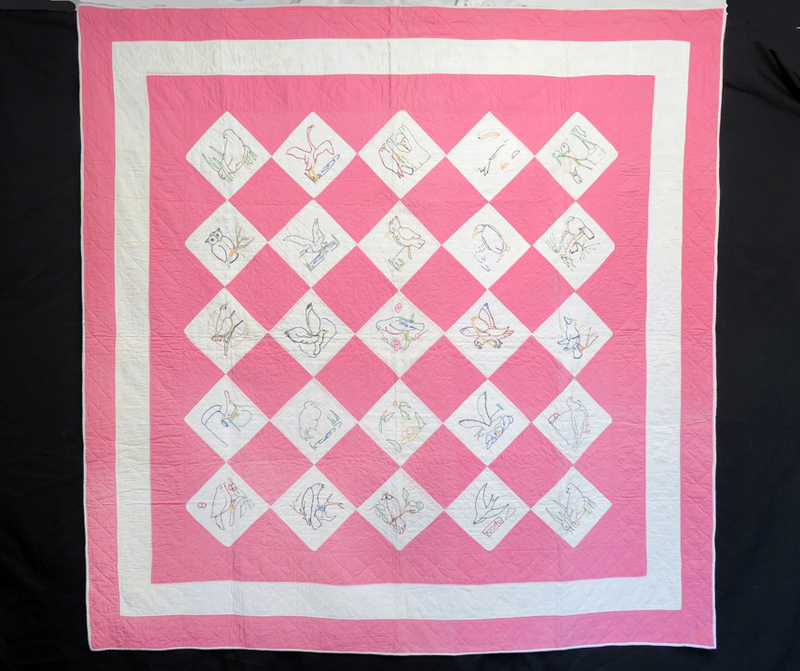 This little hand tied doll quilt appears never to have been used therefore is in perfect condition and a happy addition for a collector of dimiative origonal condition quilts. Found in New Hampshire and now professionally hand washed ,using organic products, by Betsey. Ready to be sent on approval. Created with 8 1/2” blocks, the fans have a 7” base and 4” segments. The gray wool challis border measures 5 1/4”, has a pillowcase edge and is backed with a wild and beautiful floral fabric. The unusual color combination of gray, indigo blue, tan and forest green create a dynamic graphic. The quilt has developed a few original moth holes over the last century. This lowers the price, but does not impair the quilt visually. Perfect for the wall or your bed. An optical illusion quilt changes how it looks according to the way it is displayed. In this picture we see the star configuration. If you turn this quilt in the other direction, it becomes tumbling blocks. The hexagon star block measures 13-1/4 x 9-3/4. The side of each diamond is apx 3 inches. The green triangles that join these blocks have 6 inch sides. When you stand back and look at the quilt, you can see that the green triangles also form stars. There is a 3 inch border on this quilt which is comprised of a 1-1/2 inch white strip, a 1-1/4 inch green strip and finished with a 3/8 inch turned over white binding finished by hand. Entirely pieced and quilted by hand and seemingly made for one of today's size beds. This is from Sanford, ME, yet finding a quilt from New England with a turned over binding is very unusual. New Englanders usually sew separate applied bindings onto quilts. This textile appears to be unused. Because of the size, and because it can be turned in either direction, this quilt will fit a single, double or queen (with a thick mattress) size bed. It is professionally hand washed by Betsey and ready for your home. 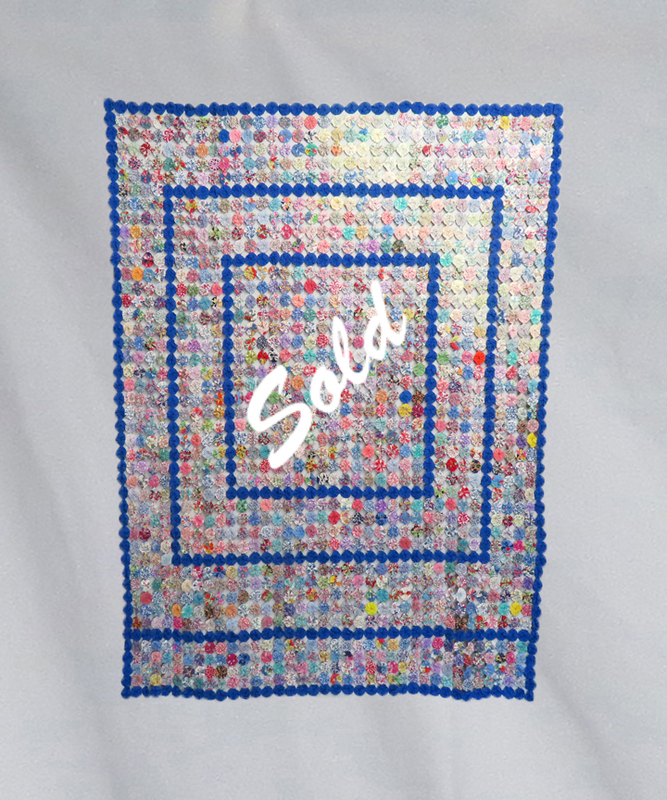 A wonderful little Postage Stamp Doll Quilt totally comprised of 1-3/4” squares finished with a 3/8” hand applied binding. This diminutive doll's quilt is completely hand sewn. 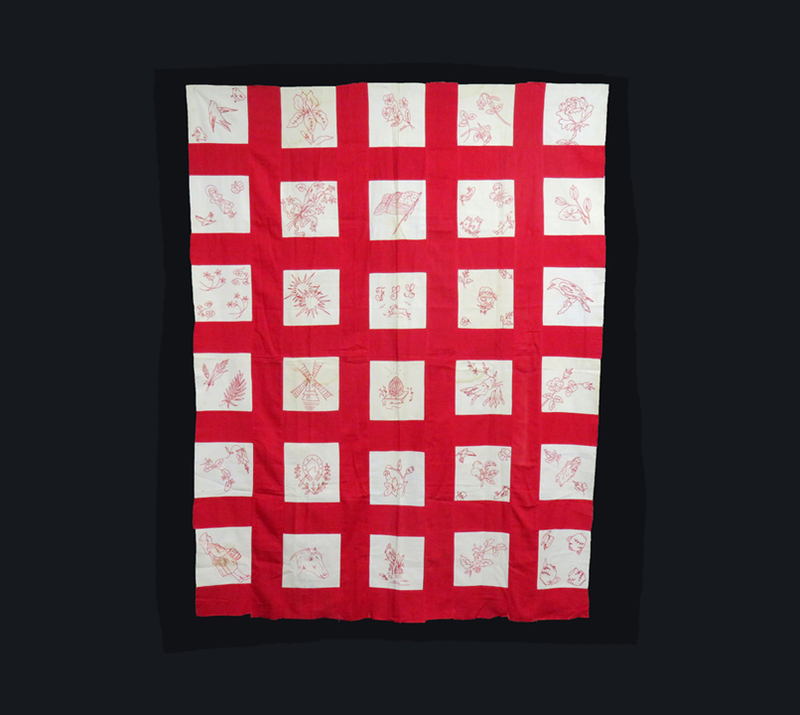 The Turkey Red calico predated the creation of this quilt and dates from around c.1850 while the red calico and the black, white and red calico backing date from later than 1865. It is possible that this little piece is civil war era. Appearing never to have been used and in perfect condition, this piece would be wonderful as art on the wall, as a table runner, and of course, as a doll quilt in a cradle or doll's bed. The perfect piecing would indicate that a Mother or another adult created this little quilt for a child. Why was it never used? Professionally hand washed by Betsey and ready to be sent on approval. 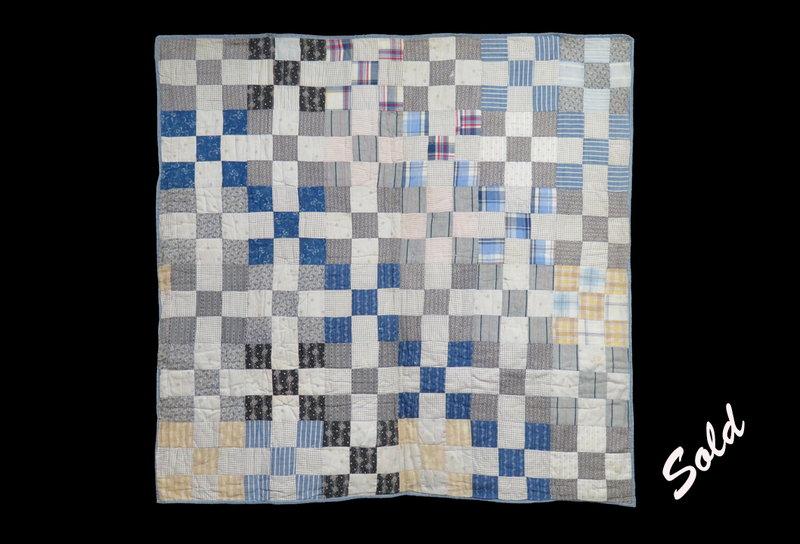 This Jacob’s Ladder quilt has been executed on the diagonal. The piecing is comprised of 16 7” square blocks, 3-1/2" square broken dishes and 3-1/2” four patches. The fabric used in this creation is a miniature daisy calico in teal, raspberry pink and white. There is a 3-1/2” border of teal daisy calico in a broken dish formation creating a sawtooth border. The hand sewn applied binding is 1/4”. This quilt is pieced and quilted by hand. The piecing is perfect, the quilting nice and neat and on the diagonal throughout the quilt. This will fit most beds from queen to king as it can be turned in any direction. Professionally hand washed by Betsey and ready for your home. 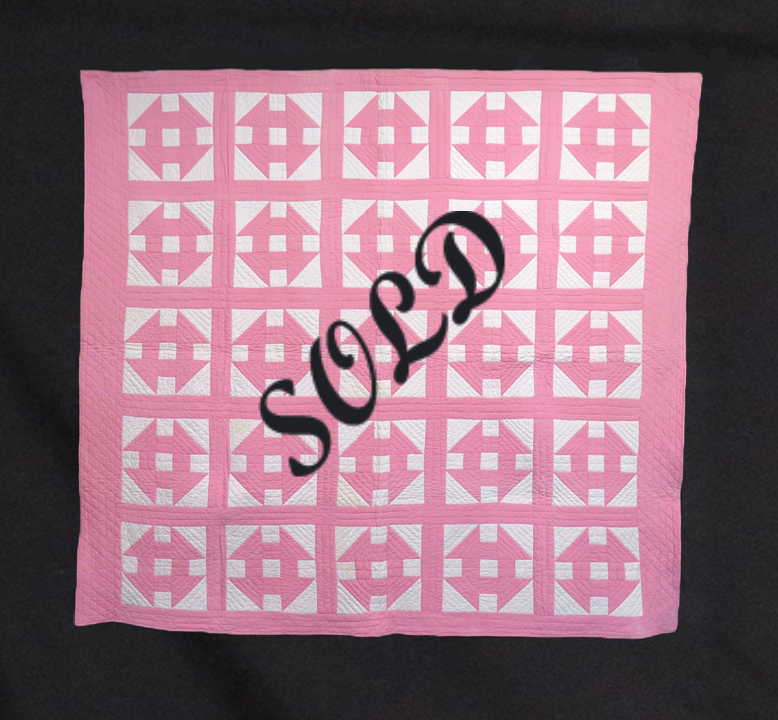 This very happy Cake Stand quilt is in perfect unused condition. Is it possible the quilt was made for a birthday present and too special to be used? All blocks are on point and measure 10 inches square. The center triangle in each block measures 7-1/2 inches on the base and 5-1/2 inches on each side. The triangles on the top of the Cake Stand, which represent the candles, measure 2-1/2 x 2 x 2 inches. The alternating white blocks are wonderfully quilted with wreaths. Other triangles are embellished with what appears to be leaves. The balance of the quilt, including the border, is quilted in diagonal lines. The piecing is done by machine and the quilting is done by hand. The edging is comprised of two borders and a binding. The first border is the same pink floral print measuring 2-1/2 inches, the second is white measuring 2-3/4 inches and the binding is applied by hand, again the same pink floral print measuring 1/2 inch and finished by hand. Professionally hand washed by Betsey and ready for your home. This delightfully happy quilt is comprised of 7-1/4 inch outline quilted pieced cactus basket blocks with solid white blocks all on point. The artist who chose these colors loved happy spring and summertime colors. The cactus basket blocks, because they are created on the diagonal, bring the artistic view of this quilt to another level. The outside edge has a 3 inch border with a 3/8” binding. The borders have chain quilting around the entire outside edge. Each border is slightly different from the other. The diamonds have 2-3/8 inch sides, the baskets are completely outline quilted and the white blocks have a quilted leaf design. One can see the beautiful even quilting stitches when turned over. In unused condition. Hand washed by Betsey and ready for a new home. This was originally a bigger quilt. This Variable or LeMoyne Star wall hanging came to me in exactly this shape and condition. 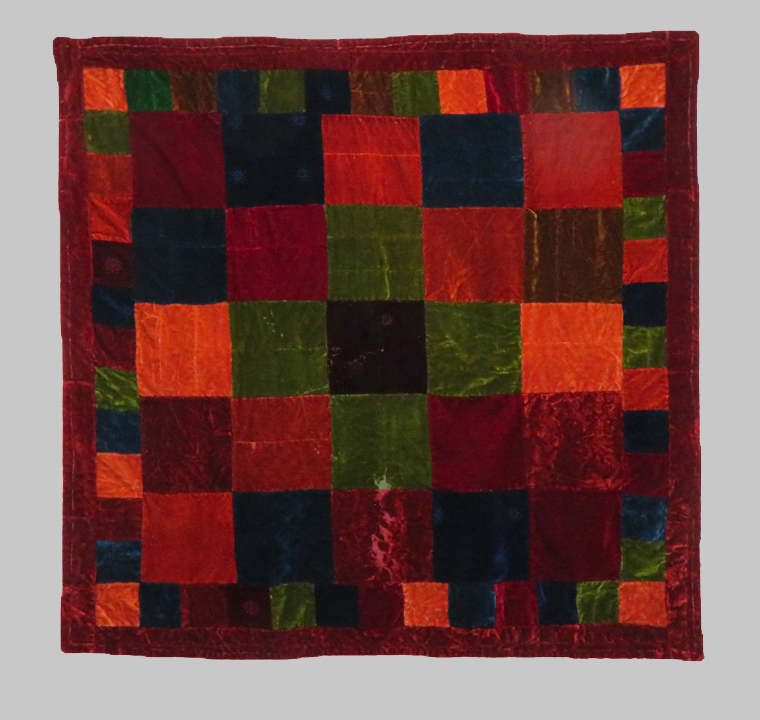 The body of the quilt is apx c.1845. Somewhere around 1860 someone took a piece of the original quilt and made a pillow cover out of it using a heavy duty striped cotton ticking as the back. It has never been finished or used as a pillow. What we have here is a wonderfully graphic wall hanging. Looking inside you can see the amazing fabric that was the backing of the original quilt. The blocks measure apx 7 x 7-1/2”, the center squares measure 4” and the triangles are 2 x 2-1/2 x 1-3/4. One edge of this little piece has been turned over 1/8” fo a binding and finished. This entire piece was created by hand before the sewing machine was invented. Even though this is in the size and shape of a bassinet quilt, by doing some detective work, we know how and what it was made for. 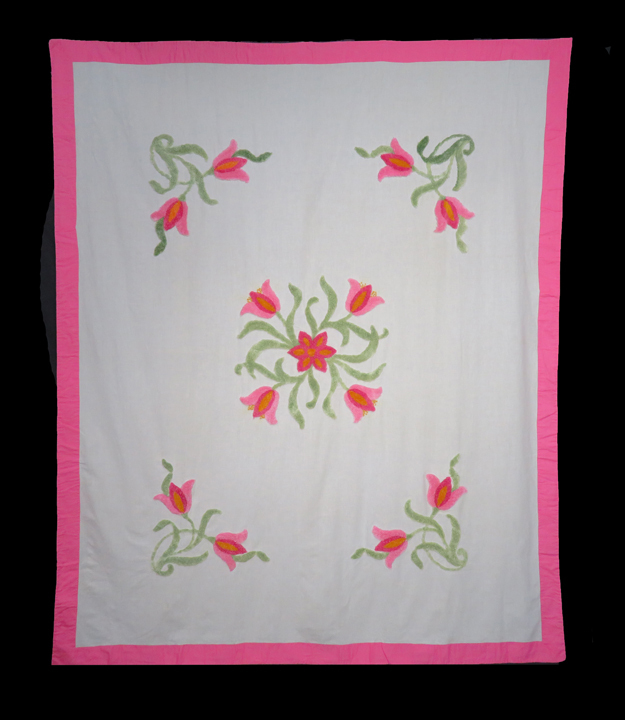 In excellent condition, this bright and cheerful quilt has been skillfully hand pieced using both a solid medium pink and white cotton. Each block measures 7-1/2 inches square. The border is a variation of the Ice Cream Cone with alternative pink and white pieces. This border is 5-3/4 inches wide, which includes a 3/8 inch separately applied pink binding. 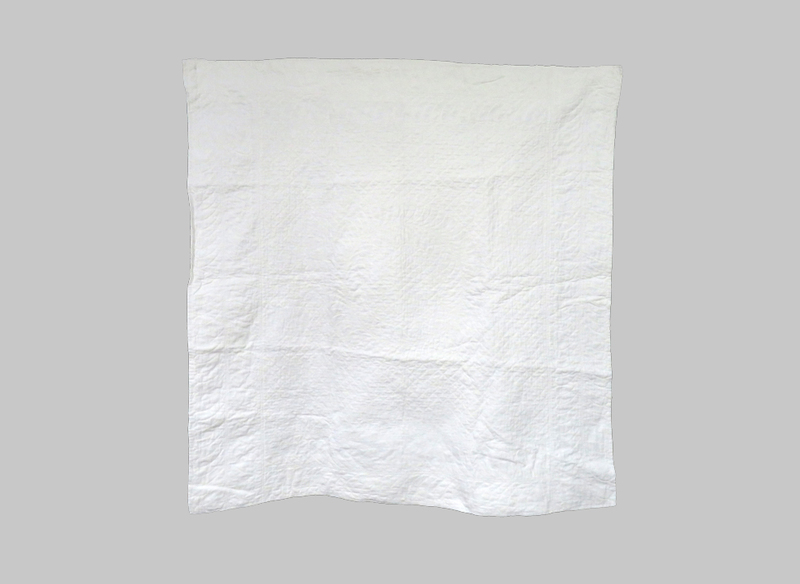 The backing is solid white cotton. Completely hand quilted with outline quilting. The white areas are hand quilted with echo heart/floral motifs. The simple color scheme insures that this piece will fit easily into many decors. Due to its size, this quilt could be used on a single, double, and if turned sideways a queen size bed with a footboard. Lovingly used, this quilt is now soft and supple. Hand washed by Betsy and ready for your home. The stencils for these birds were created by a women whose name I can’t remember. Do you know? If you know her name please email me. I have many embroidery books, and I know I have hers, but it eludes me at the moment. The embroidered blocks measure 8 inches square and are all on point. The joining blocks are a raspberry pink. There are three connected 4-1/2 inch borders all around the outside of the quilt. First raspberry pink, then white, then raspberry pink again, ending with a 3/8 inch white applied binding. All blocks and strips are pieced by machine. The hand quilting is beautifully done. Nice, neat and straight quilting with wreath variations. The cross-hatching on the border is 2 inches apart. The quilt appears to be unused. This 82 x 82 inch quilt will fit a twin, double or queen size bed. Hand washed by Betsey and ready for its new home. 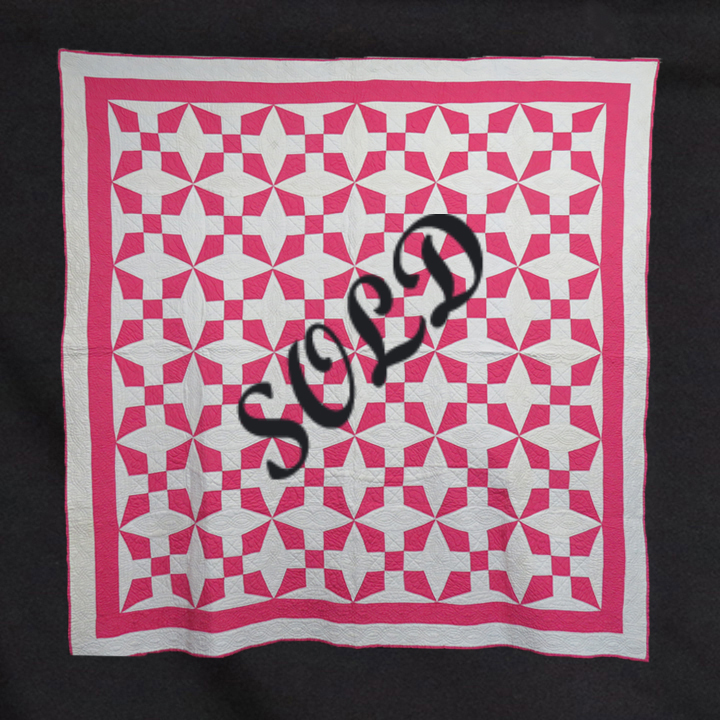 This absolutely lovely and graphic quilt in excellent condition is made up of two fabrics: a solid raspberry and a pristine white. The blocks measure approximately 10 ¼ inch square and are both hand and machine pieced. The 6 ½ inch double border is made up of 3 ¼ inch white and raspberry bands. The very fine and entirely hand done quilting was executed by a skilled hand and includes outlining in the geese, feathered half medallions in the white joining blocks and 5 line cables in the border. The ¼ inch binding is turned from front to back and the backing is white cotton. This is a crisp, beautifully quilted piece in lovely colors – what more could you ask? Professionally hand washed by Betsey. The blue in this quilt is really turquoise. But the actual color you see depends on your monitor, so feel free to view it on another computer which may display colors more accurately. This rendition of Broken Dishes has been created in very large dramatic blocks. Each block is apx. 10 x 10-1/4 inches. The creator must have loved to quilt. Pieced by hand with amazingly small stitches, she has quilted in the 1940s double lined manner. Where there is always only one stitch line, she has done a double line. 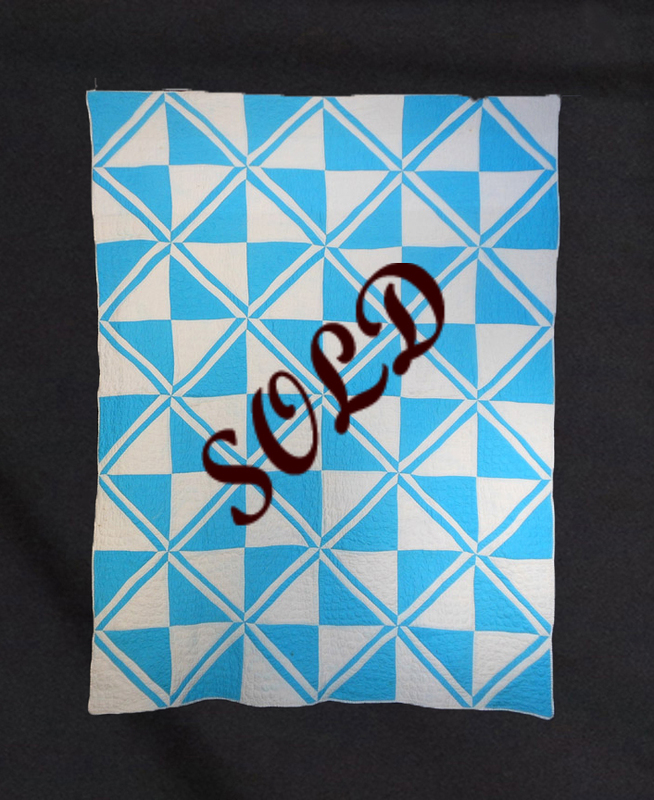 This quilt is done in a highly sought after turquoise color. Using only solid fabrics, it can be easily adapted to your already chosen printed fabrics. Professionally hand washed by Betsey. This quilt is comprised of 441 3-1/4 inch squares. Where there are only two fabrics we may assume these were purchased. One of the squares is a wonderful 1920s calico with blues, yellows, reds and browns. The other squares are a medium blue, or cornflower blue. It is completely hand pieced and hand quilted. Most of the blocks are outlined quilted. The entire quilt is quilted diagonally in both directions every two inches. The backing is an ecru color muslin and the binding is the backing turned over to the front and stitched by hand. In unused condition from Missouri, this cotton quilt has been professionally hand washed by Betsey and is ready for its new home. 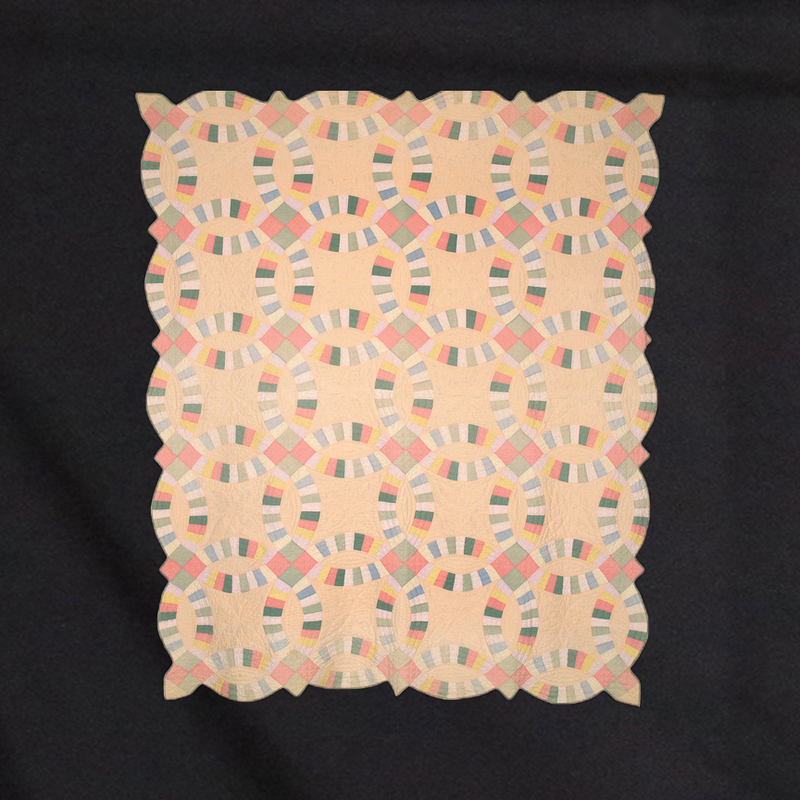 This Extended 9 Patch is also an optical illusion pattern. What fun! Designs are always more visual when hung on the wall and more subdued when laid on a bed. The blocks measure apx 15 inches tip to tip. The 5 squares within the block measure 2-1/2 inches while the ellipse that joins the Extended 9 Patch measures 10-1/2 x 3-1/2. The edge of the quilt is finished using two borders on all four sides. The first border is 2-3/4 inches wide and in raspberry pink. The second is 2-3/4 inches wide in white. The binding is 3/8 inch hand sewn, applied in white. The entire quilt is pieced by hand and quilted by hand. There are different motifs quilted inside the blocks and pieces. Outside strips each have a 3 inch chain stitch all around the quilt. Quilting stitches throughout this piece of art are nice and even. The entire piece is beautifully executed and is in unused condition. Professionally hand washed by Betsey and ready for your home. This funky adaptation of Jacob’s Ladder feels more like modern art than an antique. This brings up the question: who copied whom? As bold and graphic as this quilt appears when hanging, the visual impact is much more subdued when laid on a bed. Measuring 74 x 86 inches, this wonderfully executed quilt can fit a range of beds from single to double to queen. There’s a 2-3/4 inch border, in a slightly different shade of white from the body of the quilt. On the main body of the quilt there are a few blocks also having this fabric. Unless you’re searching for these blocks, you will not discern them from the other blocks. This quilt has 6 inch square blocks. There are 6" solid white, then pieced 9 patch blocks. The opposing corners when joined together create a different horizontal pattern. Completely hand pieced and hand outline quilted, this quilt has a turned over binding from back to front finished by hand. The binding is also outline quilted, giving the look of a separate applied binding. This wonderfully artistic quilt appears to be unused. Professionally hand washed by Betsey. A happy whimsical Yo-Yo “Quilt”. We photographed this Yo-Yo hanging over a white sheet. Whatever solid color you have on your bed will show through when you place this Yo-Yo on top. I have heard happy tales of children cutting out fabrics for their mothers and grandmothers to help make this “quilt". This is the perfect way to use up all the fabric scraps left over from making clothing and quilts for the family. 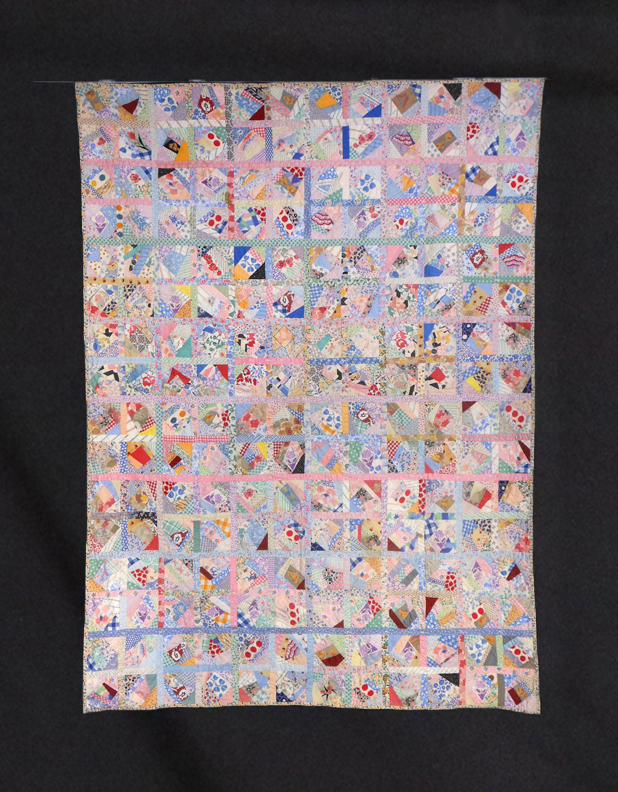 During the depression, many people made their own clothes, which left many scraps to use for this type of "quilt”. The Yo-Yo’s measure 1-3/4” in diameter. The royal blue solid color fabric creates a very graphic piece of art. In perfect, unused condition and organically hand washed by Betsey. Family name upon sale. Provenance available on sale. In perfect condition, this great cotton 20th century quilt has a color palette and design both fresh and vibrant. The Ocean Wave pattern is classic, very graphic and works well here with happy solids of yellow and lavender. Triple borders feature a 2 1/4 inch wide white and lavender sawtooth flanked by two 1 1/4 inch wide solid yellow borders, with the top and bottom edges having a fourth border in a slightly lighter hue of the same yellow and measuring 5 1/2 inch wide. Hand quilting is lovely and includes floral centers in each yellow block, parallel lines in the purple and white waves, zigzag stitching in the two yellow borders, outline stitching in the sawtooth border and 3/4 inch diagonal cross hatch in the upper and lower yellow borders. Very nice and precise handwork. Backing this quilt is the lovely soft yellow cotton featured in the upper and lower borders on the front of the quilt. The 3/8 inch applied binding is the same solid lavender found in the pieced front. A happy and graphic quilt that would be gorgeous on a bed or as graphic art for the wall it is in perfect, unused condition. Professionally hand washed by Betsey (its first bath) this quilt can be sent to you on approval for private viewing in your home. A sweet, early bassinet quilt hand pieced and quilted in the Bow Tie pattern. The maker's choice of palette in solid Turkey red, cheddar and off white make it graphic, while her imprecise cutting and hand piecing make it charmingly naïve. Add to that evidence of somewhat irregular hand quilting stitches and it suggests creation by a young girl, possibly for a new sibling? Whatever its history it makes for a great piece of folk art for either a traditional or contemporary setting. The placement of color makes a snowball or bull's eye pattern with the off white bow ties becoming the background. Bow Tie blocks measure between 3½ inches square to 3¾ inches square. The wonderful cheddar border measures approximately 2 inches on the long sides and ⅞ inches on the short sides. The off white backing folds to the front and is hand stitched down to form the ⅜ inch binding. Hand quilting includes outline stitching for the bow ties and corner blocks, with double parallel lines stitched in the cheddar border. Professionally hand washed by Betsey this little quilt was used and lovingly cared for and is in excellent condition. It can be shipped to you on approval for private viewing. This is an unknown pattern comprised of a combination of at least three or four known patterns. In today’s world, the woman who created this quilt would probably be an engineer. A mathematical and engineering feat, this optical illusion quilt, because of the fabrics, has resulted in a very happy and positive piece of art. Pieced by machine and quilted by hand, the fabrics date from the 1920s to 1950. Each and every triangle is outline quilted by hand and some are echo quilted, also by hand. There is an 8-1/2 inch raspberry pink border with a 4 inch wide rope design quilted all around the edge. The binding measures 3/8 inch and is finished by machine. The corners of this quilt are curved, creating a wonderful effect when on a bed. This graphic quilt would also be great on a wall. It has today’s colors, raspberry and turquoise. One pattern is a 4 patch broken dishes, one is the LeMoyne or Ohio Star, a third pattern is a variation of Jacob’s Ladder, while the forth pattern is the Ocean Wave. 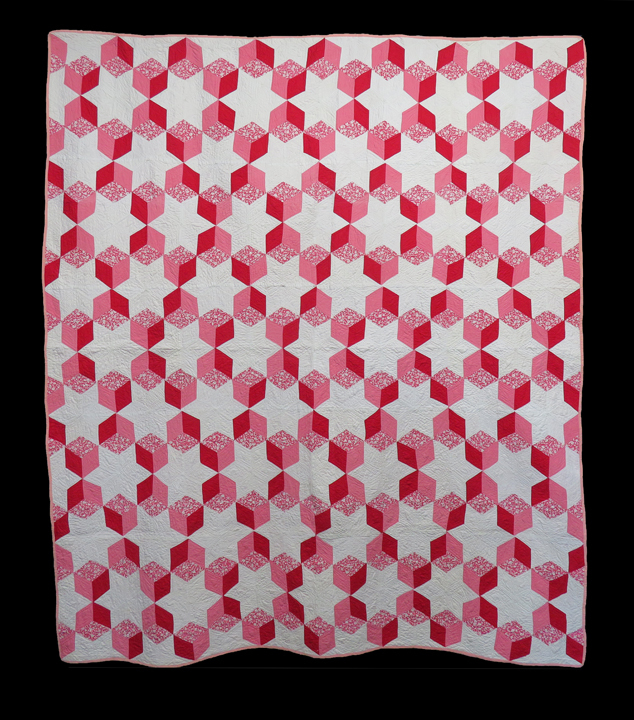 The backing is a whole cloth raspberry pink, enabling this quilt to become completely reversible. What a mathematical masterpiece! This quilt appears to be in perfect, unused condition, is professionally washed by Betsey and is ready for a new home. Click on the pictures below to see more views of my Antique Quilts. Shading is due to lighting, not representative of the quilt. Please call for the availability or any questions. This is a lovely and quite large Yoyo coverlet. Strictly speaking not a quilt as it is not backed, quilted or tied, this wonderful textile would make a happy statement wherever it was displayed. Each hand gathered yoyo is 2 inches in diameter, hand sewn to its surrounding neighbors to create a fun display piece for your home or as a coverlet on the bed over your down comforter or Matelasse spread. We can't begin to count the number of different 1920's to 1930 cottons used in the making of this coverlet. The soft purple and lavender paths create a nice pattern overall. With its large size and multiple hues it can be used almost anywhere a splash of fun and color is desired, from a bedroom to a playroom and beyond. Professionally hand washed by Betsey this Yoyo coverlet is in perfect condition and can be sent to you on approval for viewing in the privacy of your home. 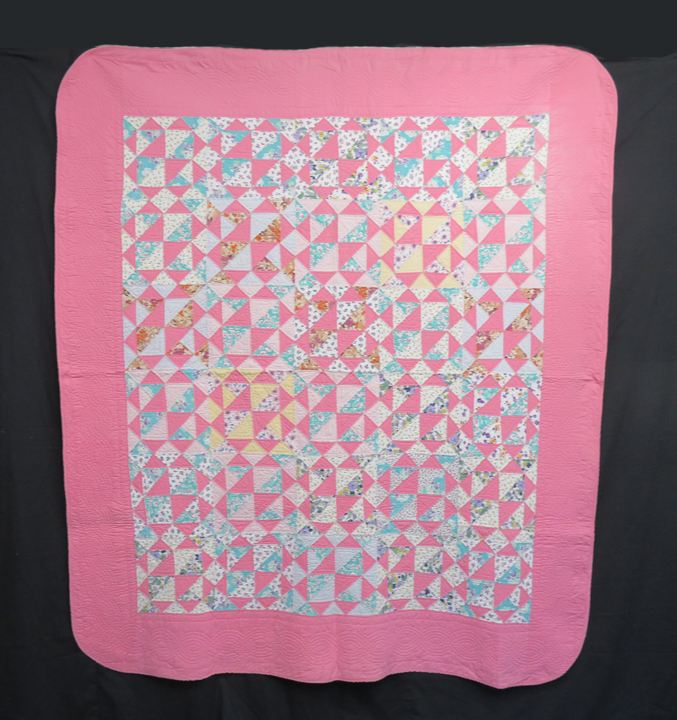 This very happy little youth size cotton crazy quilt has been created by using blocks and sashing. Approx 3-3/4" blocks with 1" sashing. On this quilt you have one of the most amazing arrays of 1920s fabrics. The backing and the binding are very unusual black, white, peach, and pale green print. The sashing where it joins each block has been tied. There is cotton batting inside. This quilt was originally made for a twin bed. Turned sideways it would cover and go over the edge of a queen bed. The best way I can describe this quilt is "very happy". It is completely pieced by hand. The applied binding is also by hand. What a happy way to study the 1920s fabrics. Complete original condition. Professionally hand washed by Betsey. 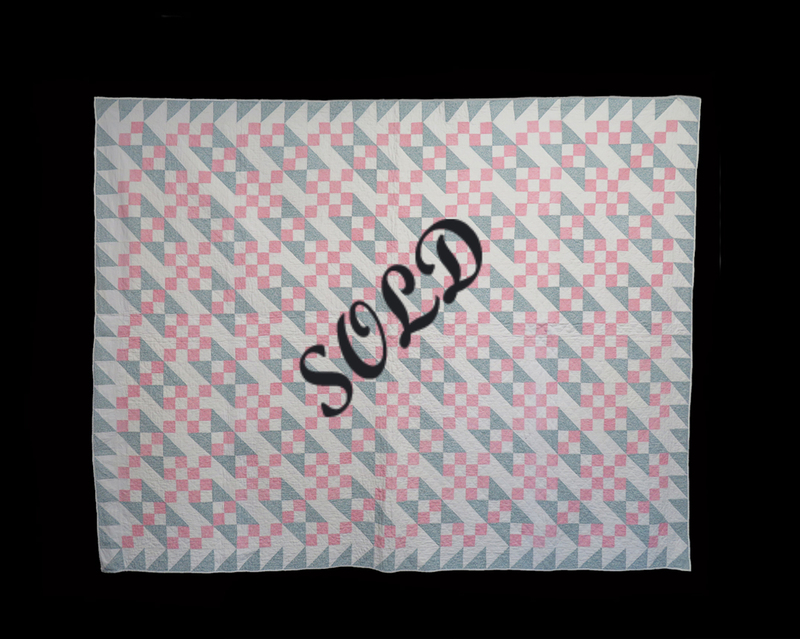 This graphic quilt, in a medium pink color that some might call Flamingo Pink, is a perfect fit for a single or double bed. This color is both vibrant and happy, and the quilt is all hand pieced and hand quilted with an appliquéd 3/8 inch binding by machine. Years ago the average woman would not boast about possessions. As a result possibly this woman was trying to let people know she had treadle sewing machine. Where she was capable of this quality of work then why use a sewing machine? The blocks used in creating this quilt measure approx. 11 x 11 inches with 2-3/4 inch wide sashing. Two opposing borders of the edging measure 5-1/2“, the remaining two borders opposite each other measure 3”. The quilting is nice and neat and from the photo of the backing, you can see that there’s an abundance of it. This quilt appears to be unused and now professionally washed by Betsey, it is ready for a new home. 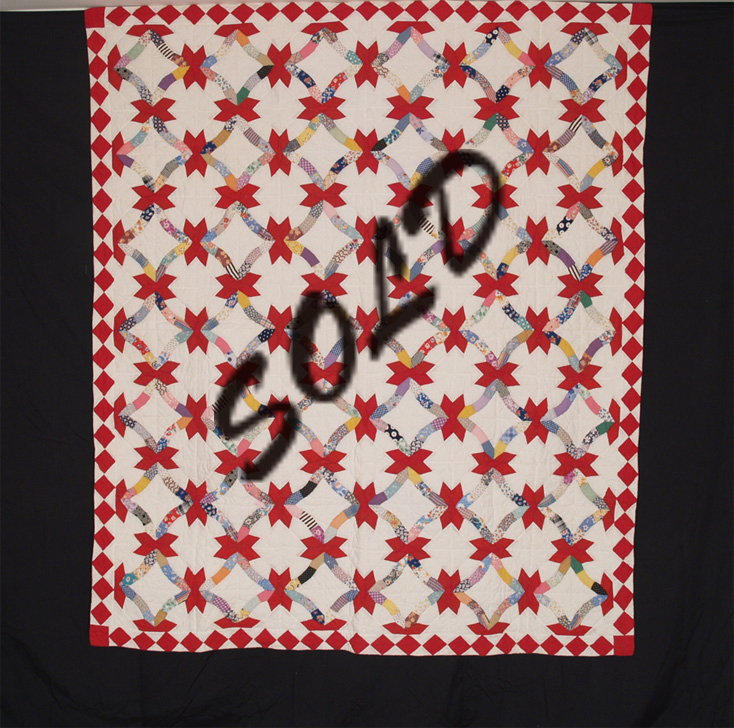 A wedding ring quilt with flair, this very graphic Depression era quilt sports pretty bows and a red and white diamond border. 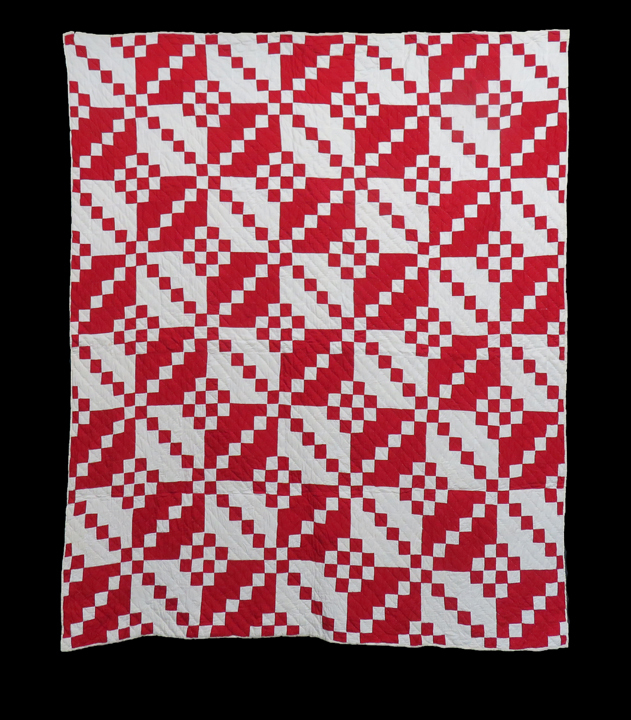 Solid red ‘ribbons’ connect the wedding rings on this cozy quilt. The same solid red is used in the 2 1/2 inch wide diamond border. Multiple plaids, florals, stripes and calicoes from the 1920’s make up the pieced rings. Hand quilting is minimal and includes outline stitching and large crosses stitched between the rings. A pillowcase edging joins the front to the back of the quilt which is a creamy white muslin. The filling is a medium loft bat giving this quilt some thickness for a cozy feel. 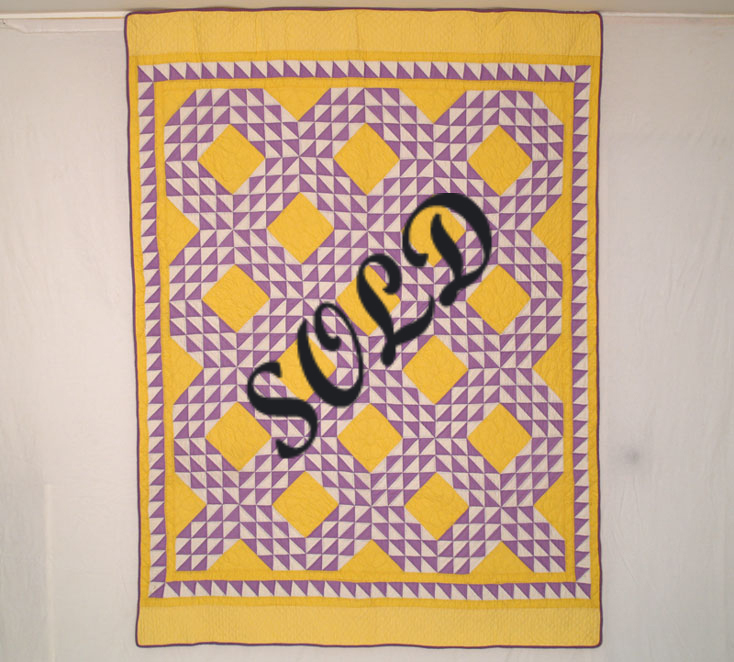 A nice variation of the wedding ring pattern this quilt is in excellent condition. Professionally hand washed by Betsey and ready to send to you on approval for private viewing in your home. This exquisitely designed quilt is all hand pieced, hand appliquéd and hand quilted. The creator has borrowed concepts from two different social backgrounds to create her piece of art. The 4 block formation was a design from the 2nd quarter of the middle part of the 19th century. The appliquéd motif is reminiscent of a Hawaiian design and may actually be a copy of such. This is beautifully appliquéd, reverse appliquéd and quilted with minuscule stitches. 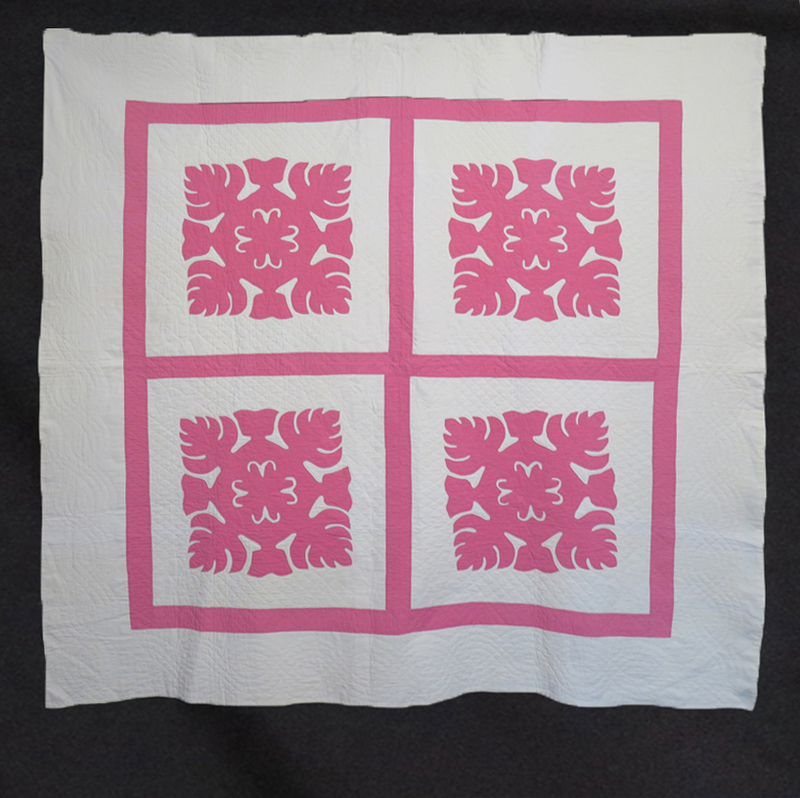 There are stars quilted in the raspberry pink center and around the center of the Hawaiian block. The 24 inch square blocks have an apx 2-1/2 inches of sashing around the blocks creating a visual of 4 separate blocks. The white areas around the appliqué have cross hatched stitching and the each appliqué piece has been outline quilted. On opposite sides of the quilt the border white is 7-1/4 inches. Nine inch white borders make up the two opposing sides. The front is turned over to the back and stitched by hand for a finished binding. Turned over bindings were often used in Pennsylvania. The backing is a heavy duty cotton almost giving the appearance of linen. In apparently unused condition and now hand washed by Betsey, she is ready for a new home. 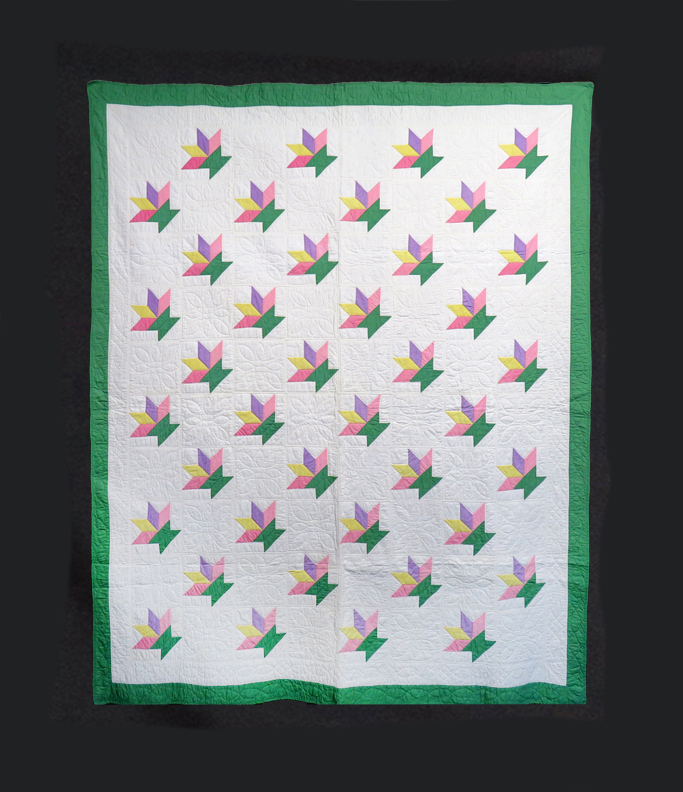 This classic quilt in the Grandmother’s Flower Garden pattern contains a fun assortment of plaids, florals, and calico fabrics from the late 1920’s through the early 1930’s. Each hexagon measures 1 inch per side, or 1 5/8 inches across, and the flowers are carefully arranged in a circular fashion according to color. The center flower is pink, the next circle of flowers are blue, followed by concentric circles of light pink, green, peach, purple and blue. All of the flowers are unified by their yellow centers. 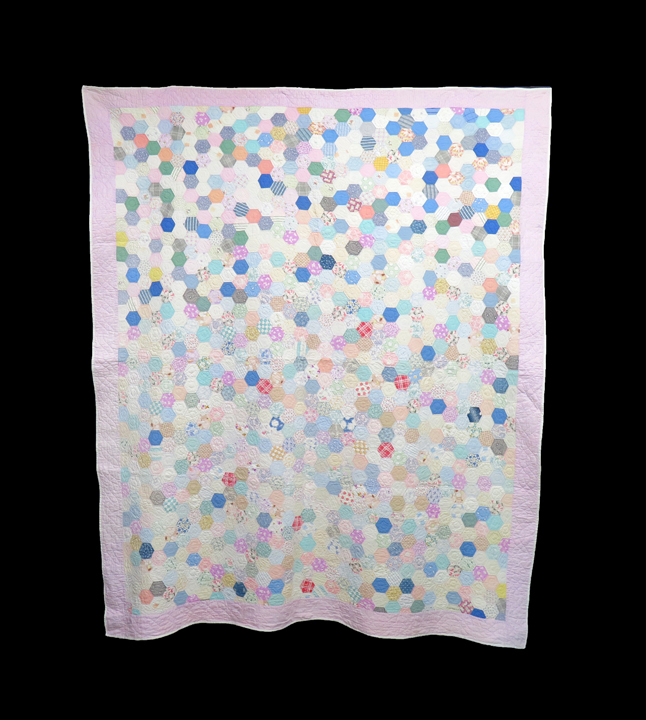 The garden paths are white, and the outer perimeter of the quilt is bordered by light pink hexagons. 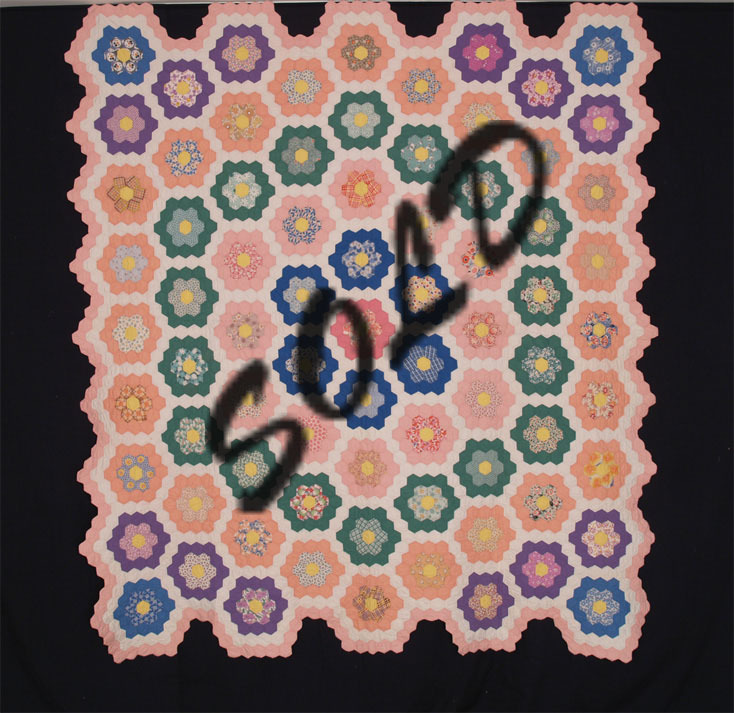 This beautiful quilt in unused condition is entirely hand outline stitched around each hexagon. The backing fabric is white cotton. The detailed edging of the quilt is lovingly enhanced with a pillowcase edge done by hand with tiny whip stitches. A lovely, pristine quilt that fits a queen sized bed!! Professionally hand washed by Betsey and ready for you to see on approval. This lovely, cotton quilt is in the popular Double Wedding Ring pattern. Its extra appeal lies in the creator’s choice of solid pastels, reminiscent of rainbow sherbet, for her color palette. It starts with a lovely peach ground with rings consisting of soft blues, yellow, greens, pinks and pale lavender. The squares joining the rings are in the soft raspberry and watermelon green found in the rings. 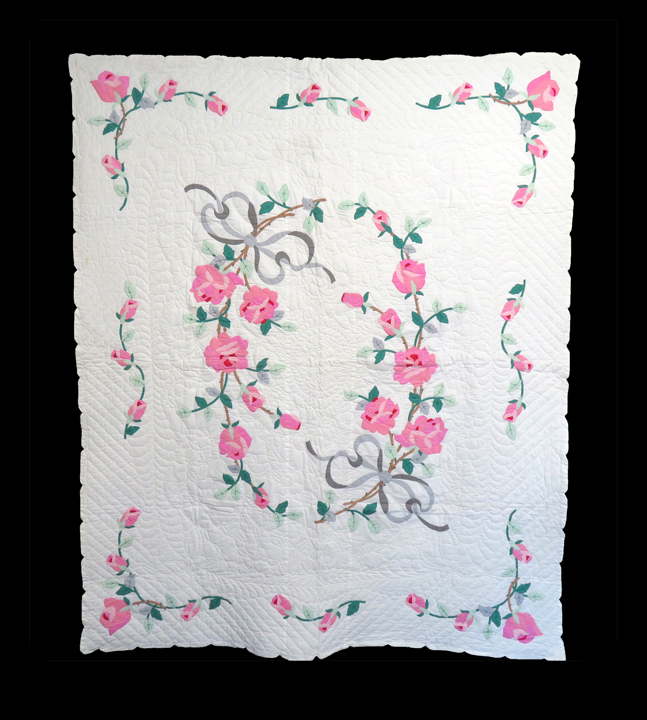 Hand pieced and hand quilted with echo, outline and cross hatch stitches this beauty also boasts hand stitched flowers with eight petals in each of the large peach areas inside the rings. 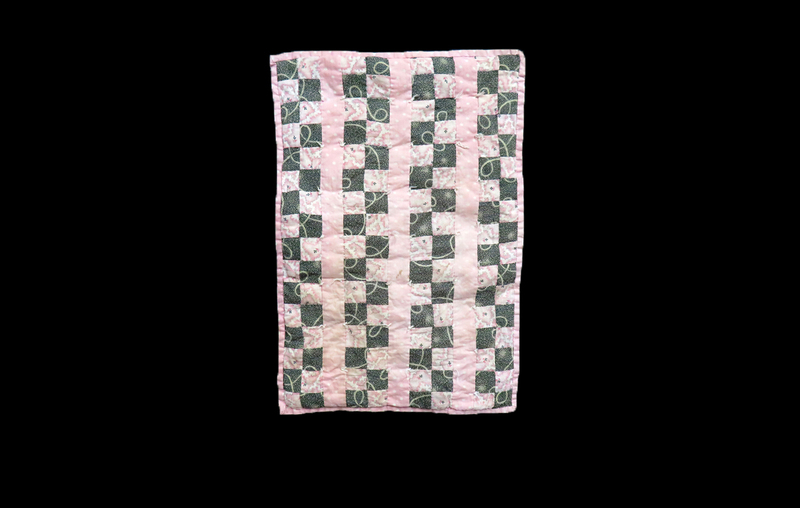 The backing is white and the skillfully applied ¼ inch watermelon green binding follows the scalloped edge of the quilt. A lovely creation that is classic in design and refreshing in fabric selection and arrangement. 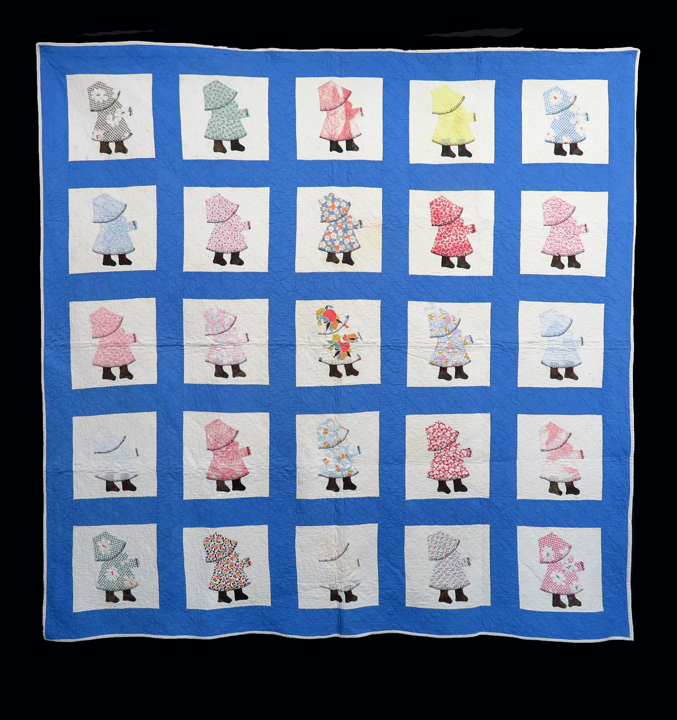 This quilt was used but lovingly cared for and is in excellent, soft condition. Professionally hand washed by Betsey and ready for your home. A creative, artistic, and expert quilter has combined several patterns using only 2 inch hexagons. The result is an original, very graphic piece of art. 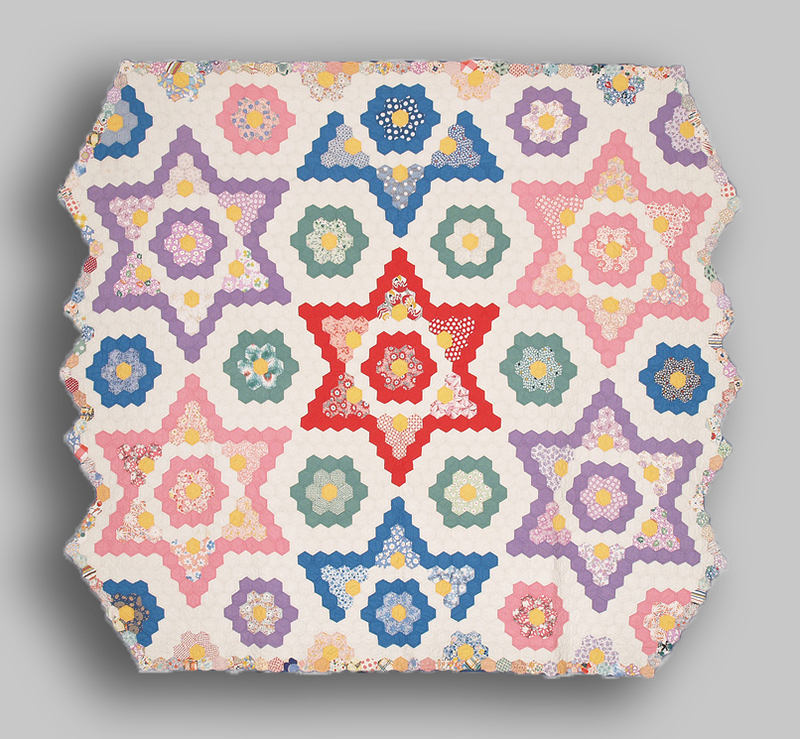 A most cheerful quilt in unused condition, this Mosaic Star would brighten any room! 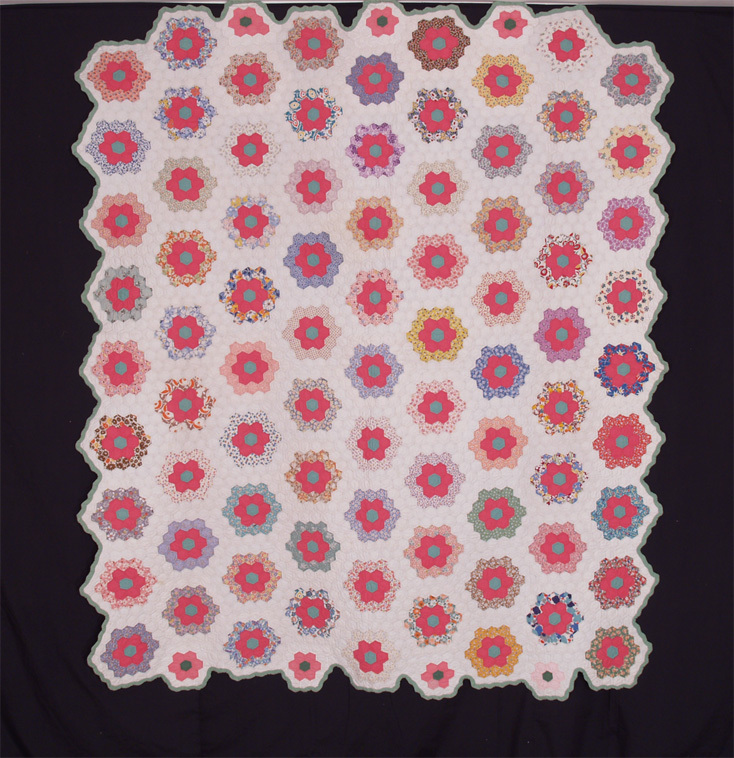 An assortment of bright cotton prints and calico hexagons were hand pieced into mosaic stars surrounded by mosaic flowers, and outline quilted by hand. Both the background and backing are muslin. The ¼ inch blue cotton binding follows the shape of the outer calico hexagonal border. Professionally hand washed by Betsey.